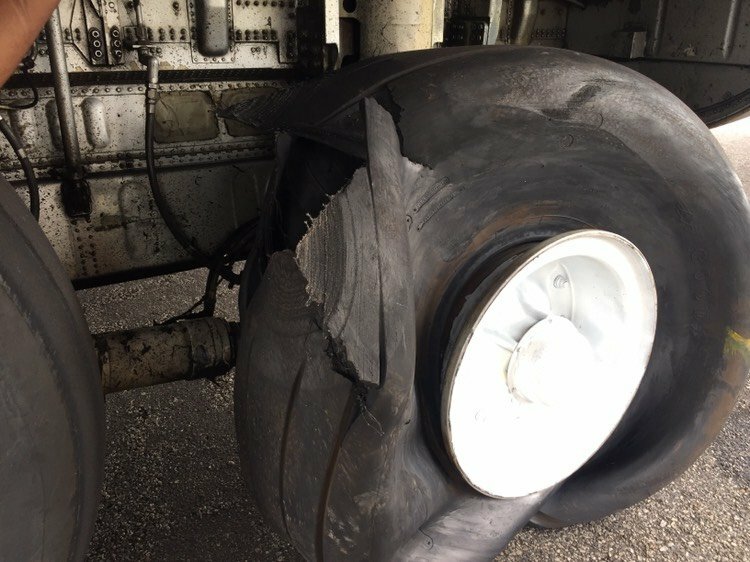 Lt rear tyre of c-130b a.c. Ser no 61-2640 brust during landing. It seems it skid through runway....but on ground check brake seems ok....and it was found free. What might be the cause....? Check back pressure of brake system (should be under 70 PSI at each wheel, if one brake reads 10 psi or more higher, look farther) , check minimum brake pressure (should be over 1700 psi and max around 2030 and should be equal between left and right under same pedal pressure), check electrical grounds for anti-skid control valves (ensure they are tight and not corroded), check anti-skid control valve filters (if dirty, replace), check brakes for ability to return (watch pressure plate return after pressure release, should return equally), check tranducers for smooth operation and check voltage output with drill. Without being there and being able to look at it, this is about best I can offer. Tons of things that could cause this but most involve electrical signal between transducer/box/valve. After so many years and flight hours, the anti skid wiring from a terminal board above the wheel well to the transducers would wear. Intermittent anti skid tests was the usual symptom. Bad test in the air good test on the ground. After you have done all listed above and you still have problems with the system, change the wire. I flew with an old A-model captain when I was an FE with Transafrik in Angola. He enjoyed telling the story of departing somewhere in the very cold icy north. The funny thing is that he departed with the parking brake set and when he landed at Pope AFB (I think), he blew all 4 mains! Before you ask about the anti-skid light, I also asked that question. He said the early A-models had no anti-skid inoperative light. Some of you old heads may remember Bonzo Von Haven -- a legend in the Herc world. Hard to believe he started TO roll w/the parking brake on.As to the anti skid,it was left off or disarmed until during the T O check list called for "ANTI SKID" and the response was "on the roll".Soon as roll commenced,C P flipped the switch,little red light went out and all was good(we hoped). The shortest F 14 landing I ever witnessed :A glitch in the brakeing system caused the brakes to lock unbeknownonsed to the test pilot.I was nearly a mile from the touchdown point when I saw 2 puffs of smoke and then heard boom boom.Of course the tires were destroyed but the wheels were worn off half way to the axel. Naha Okinawa 374th FMS Electric shop 4 Sqdns of C-130As, 21st, 35th, 817th, 40yworst (41St) being so close to ocean Anti Skid, and anyone out there who was there will back me up the "A" Model fire light (fire warning) was a nightmare. And 1 of the S@#$ jobs was replacing or repairing terminal strips under flt deck just inches from the removable steps about 8 inches from floor upside down on a shelf. I would do it all over again in a minute!